Of course, Stallone found a way around that problem in the recent Rocky spinoff, Creed, by standing near the fighting but not actually taking part. Perhaps the Rambo franchise could similarly continue, with the character imparting his war-torn wisdom to someone else. As the old saying goes: Shoot a man’s enemy and you save him for a day. Teach a man to mow down the population of a small country with a Browning M2 Aircraft machine gun and you save him for a lifetime. As an action film, I was very satisfied that it dealt with the Burmese situation. It had one foot in a current event, the longest civil war in history, 65 years at that time. It was so brutal, which civil war is, I was shocked they even gave me an R-rating. I didn’t want to compromise. I said, “This is probably going to be the last decent film of this genre that I’m going to do as a solo act.” When that was accomplished, I never felt the same willingness to do it again. In related news, Stallone also is no longer involved in the Rambo TV series in development at Fox. 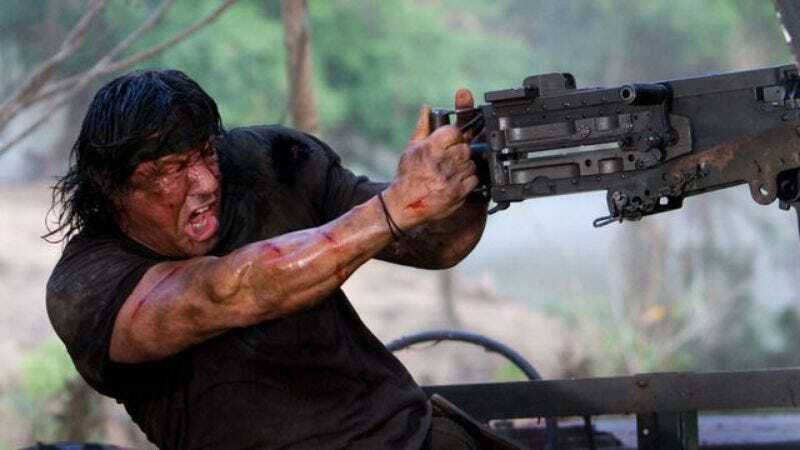 That story will follow John Rambo’s son, a focus that Stallone considers dubious at best. “I don’t want to cast aspersions,” he said, “but it’s delicate to try to replace a character with his son. I’ve seen the son of Flicka, the son of Tarzan, the son of King Kong, the son of Godzilla. It’s a very difficult premise.” Sure, Stallone just acted in a movie that was basically Son Of Creed, but we’ll forgive him for missing that. After all, it’s refreshing to find a guy in Hollywood who wants to quit while he’s ahead.